Welcome to the website of the House "MARTINA" and thank you for choosing our site to inform yourself about the accommodation on the beautiful island of Lošinj. The family house has a ground floor and a first floor. On the ground floor, are we, the owners and your landlords. The house is located just outside the city center (the distance is only 15 min. 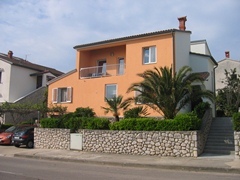 on foot), close to shops, exchange office, pizza place and one of the best restaurant on the island (distance 5 min.). The nearest beach and diving center are just 10 minutes away. The nearest beach is called Bojčić, it is a rocky beach and has adapting inputs in the crystal clear sea. Choose one of our 2 apartments with 3 stars, which are located on the 1st floor. The apartments are available all year around. Complete the booking form and we will do our best to reply within 24 hours. We invite you to visit us and enjoy the beauty of the island of Lošinj..
ECB Exchange Rates on 24.04.2019.